Dr. Gulnara Abeuova, M.D. has been a practicing physician since 1982. 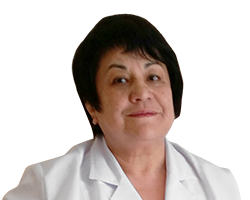 She graduated from the Almaty Institute of Advanced Medical Education in Kazakhstan and is a specialist in gynecology, oncology and family medicine. In 2005 she opened “ACAP,” her own medical center in Kazakhstan. Dr. Abeuova conducted and published a clinical study on Laminine, focusing on its positive effects on normalizing blood sugar. She personally presented her findings at the 18th European Diabetes Congress in Lisbon, Portugal in July 2017. She works closely with Executive R&D Scientist Kimberly Lloyd as well as Dr. Edward Andujar, the head of the LifePharm Scientific Advisory Board. Dr. Abeuova currently resides in Kazakhstan where she remains director of ACAP.